Da, da! Its a friendly crew of convict gang chained pirates that got stuck into the pirating fun treasure hunting through The Rocks, Sydney. Plenty of team building activities, games and clever clues to find all treasures within the set time. This team escaped. But can yours? 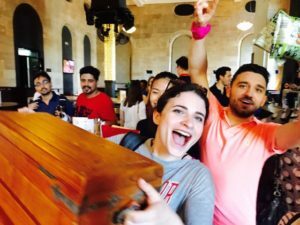 Treasure Hunts has created a series of fun social and corporate group team building activities. Along the Beaches of Sydney from Palm, Newport and Manly Beach to Bondi Beach, Coogee Beach and the sands of Balmoral. Treasure Hunting and scavenger hunts through Barangaroo, Darling Harbour, Cockle Bay, King Street Wharf, Royal Botanic Gardens. Pyrmont, Newtown, Glebe, Kings Cross, Wooloomooloo, Parramatta, Hunter Valley, Blue Mountains, Katoomba, Glenbrook, Blackheath and Leura. Through the Southern Highlands in Berrima, Bundanoon, Kangaroo Valley and down to Berry and Wollongong. Special treasure hunt events in Newcastle, Terrigal Beach, Umina, Gosford and The Entrance on the Central Coast. New to our pirate and fun hunts include The Gold Coast, Surfers Paradise, Burleigh, Southport, Coolangatta, Brisbane and the botanic Gardens both in the city and MtCootha.